Dental implants are our most sophisticated option for rehabilitating one’s smile. Designed to replace missing teeth or teeth damaged beyond repair, each dental implant can look and function just like a natural tooth. While traditional dentures sometimes involve discomfort, irritation, or slippage along the gums, dental implants are fused to the jawbone and/or maxilla for a permanent solution to missing teeth. With dental implants, Dr. Íñiguez and Dr. Martinez can restore both the look and function of your teeth, often providing a boost in confidence while improving your smile. Each dental implant replaces a single tooth—or can be the pillar for a dental bridge or support for a denture—and this restorative dentistry technique is frequently used as an alternative to traditional dentures. Dental implants are composed of a titanium post that mimics a tooth’s natural root, as well as a porcelain replacement tooth that is handcrafted to blend seamlessly with the rest of your smile. Dental implants require daily cleaning at home with a waterpik, and regular dental cleanings and checkups with your dentist allowing you to eat, brush, floss, and rinse as if you had never had any dental work done. At our practice, we can provide dental implant restorations that are made from the most advanced materials available, including zirconia and other innovative ceramics. Our zirconia implant-supported crowns, bridges, and dentures offer superior esthetics, durability, biocompatibility, and longevity. In all cases, the restorations we provide are customized to suit the unique needs of each patient and fabricated in reputable dental labs that deliver only the finest finished products. The exceptional treatment and results you receive from Dr. Iñiguez and his team are on par with what you could expect from top cosmetic dentistry practices in the United States, but at a fraction of the price. Your dental implant consultation begins with an oral exam as well as a review of your medical history. Ideal candidates for dental implants will have adequate jawbone density to support the titanium post and be in good overall health. To determine sufficient bone structure, a 3D x-ray and panoramic x-ray will be needed. Patients of virtually all ages have successfully replaced missing teeth with dental implants. Have you had radiation treatment lately? Do you consume aspirin regularly? Once Dr. Martinez determines you are a good candidate for dental implants, we can schedule a day for you to begin the treatment. What Types of Dental Implants Are Offered? Titanium dental implant systems, which include the implant post and abutment (attaches the prosthesis to the post), are the standard choice for implant dentistry and have been used successfully since the 1960s. Titanium is a biocompatible material, meaning it does not cause irritation, and has the ability to fuse naturally with the bone tissue through a process called osseointegration. Titanium dental implant systems are designed to be durable, secure, and long-lasting. Straumann® has created state-of-the-art dental implant options that include zirconium and titanium alloy models and all-ceramic zirconia systems. Straumann® claims that these systems offer unique benefits and product choices that make them superior to traditional titanium. Benefits can include added strength, faster healing, a less-invasive placement procedure, enhanced aesthetics (all-ceramic), and various quality guarantees related to specific materials and models. Dental implants that replace a single missing tooth require an implanted post topped with a custom crown prosthetic. It is possible to receive multiple single-tooth dental implants in a row, in areas throughout the mouth, or as individual replacements for an entire arch of missing teeth. When multiple adjacent teeth are missing, two and sometimes three single implant posts can be topped with a custom bridge prosthetic. 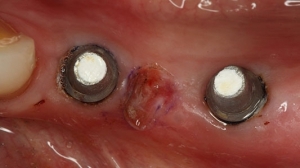 The bridge prosthetic is comprised of multiple replacement teeth fused together as one piece. We use them for full arches as well for those who want a fixed option instead of dentures. Implant bridges are often a suitable option for individuals who have some bone recession that precludes them from multiple single-tooth implants, or for those who desire a more budget-friendly treatment plan. For those who wish to replace all of their upper and/or lower teeth, full-arch denture prosthetics secured with dental implants can provide excellent results. Each arch requires two to six implants each, depending on the individual’s unique requirements, priorities, and goals. Implant dentures are often a good option for individuals who lack the jawbone density to support a full arch of single-tooth dental implants. If you are considering dental implants and want to find out which options may be most suitable, we encourage you to contact our office to speak with a knowledgeable member of our team. What Does the Dental Implants Procedure Entail? On the day of your procedure—granted you do not need extractions and a bone graft or a sinus lift—the titanium dental implants will be placed in the jawbone. Over the following four to six months, the post should fuse to the jawbone, creating a secure root for the replacement tooth. Once the healing process is complete, you will return to our office, have the porcelain replacement tooth attached to the post, and your restoration will be complete. If you do need a sinus lift or bone graft prior to implant placement, then you must wait between four to eight months to heal and build proper and sufficient bone structure for the implants. Dental implants are intended to last a lifetime. 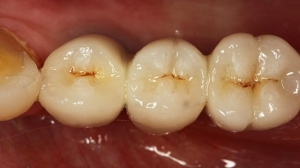 However, should the permanent crown ever become worn or damaged, it can be replaced. With dental implants, the integrity of your bite and your smile can be restored for natural-looking, beautiful results. During your consultation with doctors on staff, he can discuss the details of your proposed treatment plan and explain the exact price. It is important to note that tooth replacement with dental implants at our practice in Mexico typically costs significantly less than it would in the United States. Because Dr. Íñiguez has reached the same level of education, experience, and accreditation as many of the leading restorative and cosmetic dentists in the United States, you do not have to sacrifice quality for a low price. He is the only accredited member of the American Academy of Cosmetic Dentistry who has a private practice in Mexico, and he is dedicated to delivering the highest-quality care and results to all of his patients.